JOSE MOURINHO : I AM THE HAPPY ONE! Jose Mourinho has described himself as the “happy one” in his first press conference since returning to Chelsea. Mourinho, unveiled a week after signing a contract, kept the media waiting before walking in to be faced by a scrum of journalists and photographers. Much had been made of whether he would refer to himself as “the Special One”, as he did nine years ago. 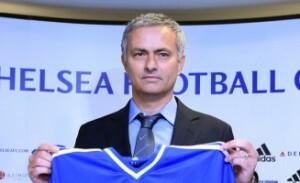 He was asked about that nickname in his first question, and responded by saying: “I am the happy one.